Bowie69 had the most liked content! I think there is some logic to swapping out both, but it will depend on your vehicle history. If you replace the slave, the mere act of bleeding the system can push the master beyond its normal operating stroke, perhaps picking up a bit of rubbish, and nicking the seal. New master time. Also, if one is leaking, there is opportunity for moisture to get in and corrode bits, making the above more likely. Also, clean brake fluid is very good at cleaning stuff, removing any sludge that may be in there helping a seal, seal. By washing it away it can cause an earlier failure than would otherwise have been. So if you know your vehicle history, then go for it, just replace the slave. On my Audi, the slave went recently, at only four years old, I had to replace the master shortly after (the original 28 year and 200,000 miles old), so I know that is still good, and it is not showing any leaks. So, I shall just replace the slave. I was getting some other odd symptoms, so I am also replacing the pipe/hose from master to slave (£100 from Audi) to make sure I don't have any further problems. If you open the cap on your master and it is full of black sludgy stuff some might call brake fluid, then it may well just be a good idea to do the lot. 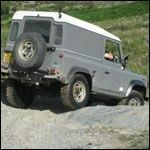 Yes, the later, t5, 6 and 7 are nothing like the earlier vans for reliability, but people keep buying them! OK, to rephrase that, 'proper utility truck', rather than 'proper off-roader'. The market is just way too small. 32 is a LOT thinner than 10w40, I'd go with the recommended.... not that expensive from any hydraulics place. The market for a 'proper' off roader is just too small for LR to really worry about, leave that to Ineos. Plus of course, if you charge 100K for a vehicle, you are likely to make more money than on a vehicle costing half that, especially if it is stylish. My prediction though -all this extreme capitalism and consumerism will be coming to an end in the next decade, people are just way too fed up with it all, and prefer a quieter life. Some say it is, but it is perfectly possible to run without it, and run fine. You can always get an RRC speedo transducer and plug it into your LT230/Borg Warner transfer case, then it would be as factory. Just look for weeping from either, bellhousing or loosen master from servo. I've user over 30psi with an eezibleed, without issues apart from having to tighten the caps a bit more. Your reservoir is perished/heat aged and clearly brittle. tis a shame, but it is rare for a job not to need any additional parts at all.